Following the end of World War II, the U.S. Military in Alaska began transitioning to a "heartland" concept of defense whereby the vast majority of military resources would be located in Anchorage and Fairbanks. Starting in 1949, the U.S. Military began spending millions of dollars in Alaska-up to $250 million annually by some accounts-on infrastructure projects in order to accomplish this mission. This postwar defense construction boom affected Alaska, particularly in urban areas, in many ways including high prices for consumer goods, a shortage of skilled workers, and an influx of people moving from the Lower 48. 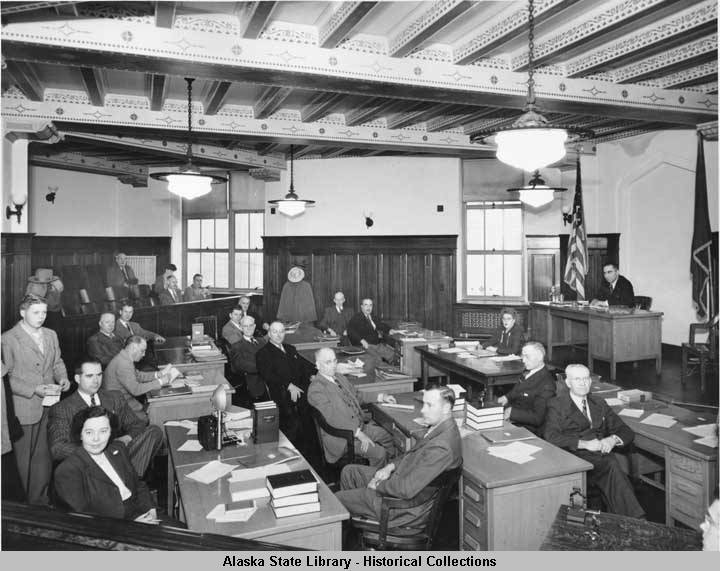 Created the Territorial Fisheries Department and the Alaska Fisheries Board. The first traffic lights in Anchorage are installed on Fourth Avenue. Alaska's population in 1950 reaches 129,000. President Harry Truman increases the minimum wage from 40 to 75 cents per hour. The Diners Club card, the first modern credit card, is introduced. The first Peanuts comic strip, written by Charles M. Schulz, appears in seven newspapers. India becomes a republic and ceases to be a British dominion. The first kidney transplant occurs. Mother Teresa founds Missionaries of Charity in Calcutta, India.